So what’s in the Spratlys? Five nations occupy nearly 70 disputed reefs and islets: China, seven; Malaysia, five; nine for the Philippines; and Vietnam with some 21 facilities “on various rocks and reefs” — according to this database maintained by the Center for Strategic and International Studies Asia Maritime Transparency Initiative. Which two islets did the U.S. Navy pick for this FONOP? The low-tension Second Thomas Shoal, “which is occupied by the Philippines,” according to Bloomberg. On that shoal is Manila’s “Sierra Madre, a Philippine Navy transport ship intentionally grounded on the reef and maintained by a contingent of marines,” AMTI notes. And that’s it. You can even see the ship, here. And the high-tension Mischief Reef, claimed by China. Look all around Mischief and see, e.g., quite a few things including alleged surface-to-air missile facilities photographed by DigitalGlobe for CSIS. For your ears only: How did all these tensions in the South China Sea begin? And what should the U.S. and its allies understand, and consider doing from here? We explore those questions and more in our latest episode of Defense One Radio, Beyond South China Sea tensions, part one: The Tinderbox, featuring interviews with Samantha Hoffman of the Australian Strategic Policy Institute; Elsa Kania of the Center for a New American Security; Greg Poling of the Center for Strategic and International Studies; Andrew Wilson of the U.S. Naval War College (not speaking on behalf of the Navy or the Defense Department); and Pamela Crossley of Dartmouth University. And stay tuned later this week for part two, which will look into what we understand of the Chinese Communist Party’s goals and its peculiar take on the future of China’s history. 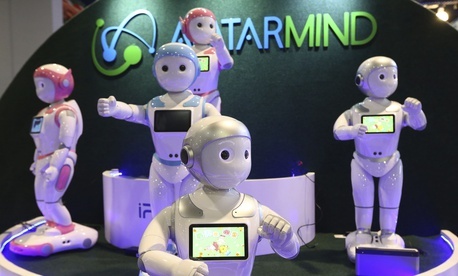 Trump To Feds: Prioritize Artificial Intelligence Work // Patrick Tucker: A sweeping executive order to be signed Monday will push agencies to boost funding, improve training, and propose regulations for AI-related efforts. 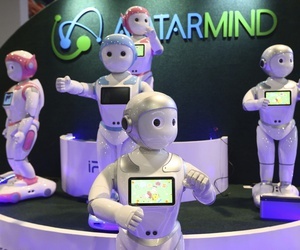 China’s Rapid AI Development Has Its Limits: Report // Paulina Glass: Chinese artificial-intelligence researchers are aware of ways their work lags the United States’ — and Beijing is working to fix those. Startups Should Love Government Work // Joel T. Meyer: New pathways to federal business are helping young companies thrive — and the government to get what it needs. US Army Aims to Put Cloud Data In Troops’ Hands // Jack Corrigan, Nextgov: The Army Research Lab is funding tech that could put the computing power of the cloud in the hands of individual soldiers—and ultimately bring more artificial intelligence to the battlefield. State Dept. Taps Ex-Fox News Correspondent to Counter Propaganda // Charles S. Clark, Government Executive: Pompeo hails vision of long-rumored appointee Lea Gabrielle. Russian-Style Kleptocracy Is Infiltrating America // Franklin Foer, The Atlantic: When the U.S.S.R. collapsed, Washington bet on the global spread of democratic capitalist values—and lost. Diplomats Aren’t Following the State Department’s Social Media Rules, Watchdog Says // Jack Corrigan, Nextgov: At least 20 ambassadors have used their personal Twitter accounts for diplomatic activities. Welcome to this Monday edition of The D Brief by Ben Watson and Bradley Peniston. Thanks for reading! And if you’re not subscribed, you can do that here. On this day in 1862, U.S. Navy Secretary Gideon Welles directed the founding of an organization to study new inventions. A little more than a year later, this organization would become the National Academy of Science. 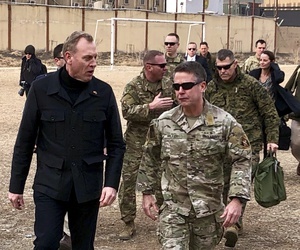 Acting SecDef Pat Shanahan dropped by Afghanistan Sunday evening — Monday morning local time, Reuters Idrees Ali tweeted with a photo of Shanahan getting the walk-and-talk Afghan war commander, U.S. Army Gen. Scott Miller. “This is an excellent mission, sir, with an extremely valuable objective, sir, worthy of my best efforts, sir.”* A week after telling lawmakers he wasn’t consulted on the U.S. withdrawal from Syria, CENTCOM’s Gen. Votel tells The Wall Street Journal’s Gordon Lubold, “I think we are right on track where we wanted to be” as Votel’s troops begin pulling equipment out of Syria. Shutdown looms again. 17 House and Senate negotiators failed “to finalize a border security agreement on Monday,” The New York Times reports. FWIW: The number of active-duty troops sent to the border is slated to pass the record 5,900 troops sent just before the November election. Could this be affecting “regular mission” readiness? 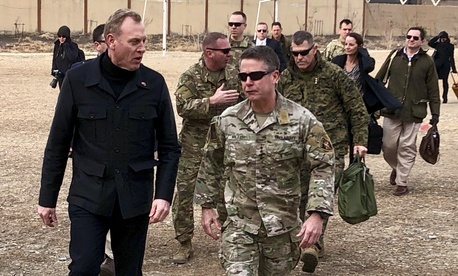 “Senior officers are voicing greater worries that the deployed troops are not conducting the training needed for their regular missions, while other military units must now pick up the routine duties on behalf of their deployed colleagues.” More on all that from the Times, here. Norway: Russia’s jamming GPS again. The Nordic country’s foreign-intelligence agency’s latest risk-assessment report says Russia has blocked GPS signals to Norwegian territory repeatedly since 2017, often during military exercises such as NATO’s Trident Juncture and “and the mid-January deployment of British attack helicopters in Norway for training in Arctic conditions,” Voice of America reports. Reminder: Russian-backed forces use GPS jamming and other forms of electronic warfare in Ukraine, where EW is “the single largest killer of Ukrainian systems,” a 2017 CSIS report said. U.S. practices GPS jamming, too — in domestic training areas. Examples include this western-states exercise last year and another one this month in the southeastern states. US to North Korea: tell us who builds your nukes. That’s the latest tack, revealed by U.S. negotiators working in the run-up to the Feb. 27-28 Trump-Kim summit. If that seems unlikely, here’s one potential endgame, via Korea Times: “Rather than listing its nuclear experts and inventory, North Korea is known to want to turn over its ICBMs to China as an “interim measure” in exchange for concessions from the international community on sanctions. Political analysts in Seoul said the U.S. could accept this plan if it materializes.” Read on, here. Kent’s death has brought new attention to what Stripes calls “a flawed commissioning and waiver process” that let to Kent’s final deployment. She was trying to get into a clinical doctoral program; she got sent to Syria instead. The New York Times has its own remembrance of Kent and all that she juggled as a member of the Navy and as a citizen, here.